By: Rachel Johnson, Ph.D, M.P.H., R.D. 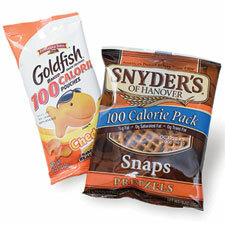 100-calorie snacks take the guesswork out of portion control. On the kitchen table in front of me sit three plates: one holds 23 thin chocolate wafers, another 9 nacho chips and the third a half pound of carrots. Each plate holds 100 calories. You may have noticed the “100 Calorie!” label on everything from cookies and chips to soft drinks. Despite the fact that shoppers pay two to three times the price for these products, they sell like crazy. Why? They take the guesswork out of portion control. The 100-calorie concept was inspired by obesity expert James O. Hill, one of the brains behind “America on the Move,” an initiative that aims to motivate people to take 2,000 more steps (about one mile) and eat 100 fewer calories on a daily basis. At a recent obesity conference I asked Jim how he had come up with the magic number of 100. A few years ago, his team examined data from national surveys and found that on average Americans between 20 and 40 years old are gaining about two pounds per year. They calculated that if people increased their physical activity and reduced their food intake by just 100 calories a day it should prevent this slow steady weight gain in 90 percent of the population. The concept is simple enough. But large portion sizes, which haunt America, are a barrier. We’ve been led to believe that supersizing is perfectly acceptable. Don’t buy it: the more we are served, the more we eat. An April study from Pennsylvania State University found that when people were presented with portions that were twice as big as a standard portion, men ate around 812 extra calories a day and women ate 530 extra calories a day. That additional food could translate into a pound to a pound-and-a-half of weight gain in one week! In a separate Cornell University study, movie-goers were given 14-day-old popcorn in two different-size containers. People described the popcorn as terrible, soggy and stale—but still ate 34 percent more of it from the larger container. An awareness of 100-calorie portions can offer a key to weight control. Most of us need between 1,800 and 2,400 calories a day, depending upon our size and activity level. Yet a four-ounce muffin the size of a softball contains 320 calories. A single slice of cheesecake can contain 800 calories—almost half of some people’s daily needs. Instead of grabbing a random calorie-heavy snack when you get a craving, make your own 100-calorie snacks. You may need to count out whole-grain crackers or check the label on the dried fruit the first few times but you’ll quickly learn the right amount. Faced with a monster-size cookie (which I know is loaded with calories), I’ll break off a piece and leave the rest. At home, rather than eat directly from the bag, I place a 100-calorie portion into one of the small, brightly colored bowls I collect and keep in the front of my cupboard. Believe it or not, a recent study showed that just using small bowls and spoons reduced the amount of ice cream people ate. Ideally, all of the day’s calories should be from healthy foods. If you opt for prepacked snacks, try to choose those with a nutritional advantage. But even if you choose Oreos, take only two and you’ve limited your calories. Just balance your calorie intake with what you expend. After reining in your snack calories, be really good to yourself and burn up an extra 100 with a brisk 20-minute walk. You’ll be much more likely to avoid that creeping weight gain. —Rachel Johnson, Ph.D., M.P.H., R.D. is senior nutrition advisor for EatingWell, and dean of the University of Vermont College of Agriculture & Life Sciences.